Inside a bottle of oregano essential oil are powerful plant-based chemicals that can help you fight a virus, kill fungi and bacteria, chase off parasites, boost your immune system, counter the effects of aging, and so much more. In this article you’ll find out how oregano is being used for healing, the latest research, and 14 practical tips for using it. Oregano (Origanum compactum, Origanum vulgare, Origanum majorana, Origanum onites, Origanum minutiflorum), is an earthy, herbaceous, aromatic herb from the Lamiaceae (mint) family. Oregano has a long history of use spanning four millennia (yes, not just centuries but millennia!) due to its healing properties and popularity in cooking. The latest research confirms that oregano has potent anti-aging, anti-viral, anti-bacterial, anti-cancer, anti-diabetic, anti-fungal, anti-mutagenic, anti-parasitic and anti-inflammatory properties (all of the important anti’s!). Oregano oil is steam distilled from the leaves of the plant. It takes around 1,000 to 1,500 pounds (453 to 680 kilograms) of leaves to create one to two pounds (453 grams to 907 grams) of essential oil. Oregano has been used as a medicine for 4,000 years by ancient Chinese, Greek, and Roman doctors and healers. The word oregano means “joy of the mountain” in Greek and refers to the fact that oregano grows well at higher altitudes. When oregano blooms it has pink or purple flowers that are edible (and quite tasty)! In Greek mythology, oregano was created by Aphrodite as a symbol of happiness. Prior to the 1940s, oregano was fairly scarce in America. American soldiers stationed in Italy during World War II developed a love for the herb and brought it home with them. A 2011 French study found that oregano contained 46 compounds, the predominant phytochemical (natural plant-based compound) being carvacrol. A recent search of the PubMed database revealed over 1,200 studies on carvacrol − a phenol that works in an interesting way against bacteria. It breaks through the outer cell membrane that protects bacteria from being discovered by the immune system. This then allows the immune system to detect and destroy invading bacteria. Yet for healthy cells it is completely non-toxic, such is the wonder of nature. Along with carvacrol, oregano essential oil also contains thymol, gamma-terpinene, para-cymene, beta-caryophyllene, rosmarinic acid, and myrcene, among many other constituents. Like green tea, oregano has a high quantity of polyphenols, tannins, anthocyanins, and flavonoids − all of which make it an excellent anti-cancer and anti-aging essential oil. These effects are mainly due to the high phenol content of oregano. In fact, oregano tests higher in phenol content than eight other common herbs. Oregano’s antioxidants are known to protect us from damage by free radicals. It neutralizes free radicals while repairing damage which has already occurred. This helps to slow the aging process, slowing macular degeneration and vision loss. It also helped delay the degeneration of aging muscles, wrinkled skin, hearing loss, and nerve disorders. A 2016 Indian animal study found that carvacrol (one of the predominant phytochemicals in oregano) had a protective effect against colorectal cancer. Chinese researchers in 2015 published a study in Anticancer Drugs stating that carvacrol had anti-tumor activity against two colorectal cancer cell lines. Researchers found it reduced tumor cell proliferation (spread), promoted apoptosis (planned cell death, a feature lacking in cancer cells) and cell cycle arrest − as well as a number of other anti-tumor effects. 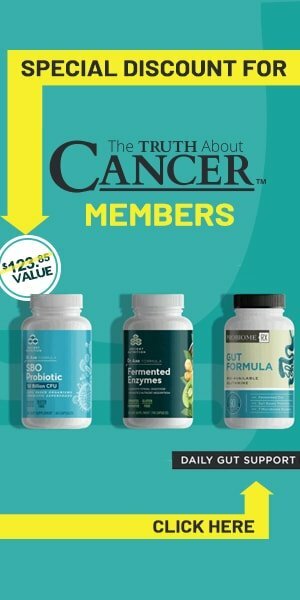 Brazilian research reported in 2014 also found that oregano inhibited cancer cell growth in HT-29 human colon adenocarcinoma cells in test tubes. An Indian study reported in 2016 found that carvacrol induced apoptosis and had cytotoxic (toxic to cancer cells) effects in HL-60 acute promyelocytic leukemia cells and Jurkat T lymphocyte cells. 2014 Brazilian in vitro (test tube) research discovered oregano was potent against MCF-7 human breast cancer cells. These are estrogen-receptor-positive, progesterone-receptor-positive, infiltrating ductal carcinoma, one of the most common types of breast cancer. A 2011 French study also found oregano to have anticancer activity against MCF-7 breast cancer cells. This research mentioned that oregano also had a high concentration of antioxidants, as well as being a potent anti-malarial. In addition, oregano has something to offer those whose breast tumors are not hormone driven. Researchers in India in 2010 discovered carvacrol induced apoptosis and had an anti-proliferative (anti-spread) effect in human MDA-MB-231 metastatic breast cancer cells. These cells are estrogen-receptor-negative, progesterone-receptor-negative, HER2 negative (also known as triple negative breast cancer). Exciting 2015 research reported in Oncotarget by Canadian researchers discovered that carvacrol reduced the migration, cell viability and invasion of U87 glioblastoma cells, an aggressive form of brain tumor. 2007 research by Moroccan scientists found that oregano has anti-mutagenic effects. A mutagen is something that alters genetic material, usually DNA, and this can lead to cancer. Oregano’s ability to suppress mutagens make it very valuable indeed. Ancient Greeks and Egyptians used oregano as an antidote to poison. Jump forward a few thousand years and modern science is catching up. A significant 2014 study reported in Clinical and Investigative Medicine found that for rats receiving the drug methotrexate, carvacrol helped to protect delicate kidney tissues from the toxicity of the drug. Methotrexate is a commonly used (and highly toxic) drug for treating, among other things, cancer and rheumatoid arthritis. More recently, 2015 Egyptian research investigated the cardioprotective effects of thymol and carvacrol on rats receiving the commonly-used chemotherapy drug doxorubicin. Researchers noted that thymol and carvacrol had a synergistic effect when used together and effectively eased the cardiotoxicity of doxorubicin. Jahahreeh Finley, patent attorney and founder of Finley BioSciences, recently stated in a June 22, 2016 LinkedIn article that AMPK, a key metabolic regulator, is turned on by carvacrol. This enhances signaling mechanisms critical for activation of T-cells, a key component of the immune system. Finley stated that “AMPK activation likely represents a central node that links the creation of all human life.” He went on to state that “if evidence continues to accrue implicating AMPK activation as a central mediator in the creation of all human life and the potential eradication of diseases thought to be incurable (e.g. HIV-1 and glioblastoma), a paradigm shift in the assessment of disease etiology and treatment is inevitable.” That’s one powerful statement! Oregano oil effectively protects the body against many different fungal infections. It is particularly useful against Candida albicans. Italian research, reported in 2016, assessed the sensitivity of 30 different vaginal strains of C. albicans to 12 essential oils, including oregano. Researchers determined that oregano and five other oils inhibited the growth and activity of C. albicans more efficiently than clotrimazole, a commonly used antifungal drug. 2016 Brazilian research investigated the effect of three essential oils, including oregano, on Pythium insidiosum. This is a water mold which causes a deadly tropical disease known as pythiosis in mammals and humans. Conventional antifungal drugs have proven ineffectual. Researchers found that oregano oil (Origanum vulgare) had the highest kill rate, especially when combined with peppermint. A 2014 American study reported in Journal of Applied Microbiology found that oregano essential oil was able to inactivate murine (mouse) norovirus within an hour of application. Researchers stated that carvacrol from oregano has the potential to control human norovirus, which most commonly causes gastroenteritis. 2015 research from Argentinian scientists found that thymol (one of the phytochemicals in oregano) was effective against a tapeworm parasite that causes cystic echinococcosis. This disease can affect the liver, lungs, and other organs. In 2010, Portuguese scientists found that essential oils containing high quantities of carvacrol, including oregano, were effective against giardia, a nasty parasite of the gastrointestinal tract. In 2013, Tunisian researchers investigating the antibacterial properties of oregano oil found that it had potent antibacterial effects against five different types of bacteria. Specifically tested were Staphylococcus aureus (better known as golden staph), Bacillus subtilis (also known as hay bacillus), Escherichia coli (commonly involved in food poisoning), Salmonella typhimurium and Pseudomonas aeruginosa − some very nasty bugs. Oregano killed them all. Moroccan researchers in 2009 investigated the effects of oregano essential oil on two strains of bacteria, Pseudomonas aeruginosa and Staphylococcus aureus. They reported that oregano induced membrane damage and exhibited potent antibacterial effects against both strains. Researchers from Iran, America and Germany collaborated on a study reported in 2016. They investigated chitin − produced by insects, fungi, and other organisms − and implicated in chitin-induced asthma. Researchers found that carvacrol and thymol potently inhibited inflammatory responses. In a study reported in Natural Product Communications in January 2016, researchers investigated the bioactivity of oregano and one other oil. They found both oils had anti-inflammatory, anti-Alzheimers, and insecticidal properties. Rosmarinic acid is one of the primary phenol antioxidants in oregano. Japanese researchers in 2014 reported that rosmarinic acid possesses anti-allergenic activity by inhibiting an enzyme known as alpha-glucosidase, also associated with diabetes mellitus. An older 2004 Japanese study investigating the effects of rosmarinic acid on sufferers of seasonal allergic rhinoconjunctivitis (allergies) found that both humans and animals given rosmarinic acid enjoyed a significant decrease in inflammatory markers associated with seasonal allergies. The potential of oregano essential oil for boosting immunity has been widely researched. Hundreds of studies, too numerous to mention here, have been carried out on animals which prove beyond a shadow of a doubt that oregano has potent immune-stimulating properties. Indeed, many farmers use oregano for their livestock for exactly this reason. Oregano also has many centuries of oral use for human immunity. It appears to work by stimulating the production and function of white blood cells, the body’s first line of defense against invasion by fungi, bacteria, etc. Russian research reported in 2014 analyzed the effect of ionizing radiation on mice. They found that taking low doses of certain essential oils, including oregano, along with their drinking water for six months increased the quantity of antibody-forming lymphocytes in their spleens. Dutch researchers in 2010 found that the carvacrol in oregano promoted T cell responses in mice with autoimmune arthritis. Immune Booster – Once daily mix several drops of oregano essential oil with an organic carrier oil, place into an empty gelatin capsule, and take internally − but not on an empty stomach (see other precautions below). Make Your Own Antibacterial Hand Sanitizer – Using a glass bottle with a pump, fill it with 8 oz (236 ml) aloe vera gel, 1/4 teaspoon vitamin E oil (as a natural preservative), 1 tablespoon witch hazel, and 30 drops oregano oil (optional: add in some other favorite oils too like lavender, melaleuca, or cinnamon). Fight Respiratory Infections – Using a cool mist diffuser, diffuse oregano essential oil for an hour in the room where you are sitting or sleeping to help your immune system fight the infection. Helps Acne – Due to the antibacterial and anti-inflammatory properties of oregano, it is powerful for acne and other skin complaints. Be sure to dilute though as the phenol content can cause problems for sensitive skin. Combine 1 teaspoon of aloe vera gel with 2-3 drops of oregano and apply it to problem areas with a cotton swab. Avoid any areas where the skin is broken such as cuts or scrapes. Oral Health – Oregano combats bacteria, plaque, bad breath, tooth aches and periodontal disease. Add a drop to your natural toothpaste and brush away those problems. Or combine 1-2 drops oregano with 1 tablespoon coconut oil and swish around in your mouth for five to ten minutes. Anti-Parasitic – Place 3-4 drops oregano oil mixed with an organic carrier oil inside an empty gelatin capsule and take at the start of a meal (not on an empty stomach). Anti-Dandruff – Place a few drops of oregano into your favorite organic shampoo to help heal scalp conditions like dandruff. Muscle Rub – Oregano’s natural anti-inflammatory properties make it an excellent muscle and joint rub. Combine it with an organic carrier oil (hemp is a great one) and rub it into the affected area. It is also useful for menstrual cramps. Athlete’s Foot & Fungal Infections – Massage several drops of oregano oil mixed with an organic carrier oil into problem areas for an anti-fungal blast. You can also get a basin of water, add a few drops of oregano, and soak nails affected by fungus. Ringworm – Mix a few drops of oregano with an organic carrier oil and rub it on the affected area. Add in a drop or two of neem oil for an additional anti-ringworm blast. Antibacterial Household Cleaner – Add 4 drops oregano oil, 10 drops lemon oil, and 1/4 cup white vinegar to a bucket of water. Use it to clean and sanitize household surfaces (don’t forget toilet seats, telephones, and computer keyboards). 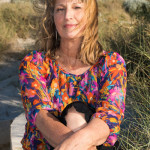 Insect Bites & Stings – Oregano oil helps to neutralize the poisons of insect bites. Apply 1-2 drops, diluted in organic carrier oil or aloe vera gel, to bites and stings. Ear Infections – Apply 1-2 drops of oregano, diluted in an organic carrier oil, around the OUTSIDE of the ear (never inside the ear) until symptoms disappear. Disappear Warts – Mix 1 drop of oregano with an organic carrier oil and apply directly on a wart, covering it with a bandage. Replace bandage daily and repeat until wart disappears. Due to its phenol content, oregano is a HOT oil. Be cautious when using it. 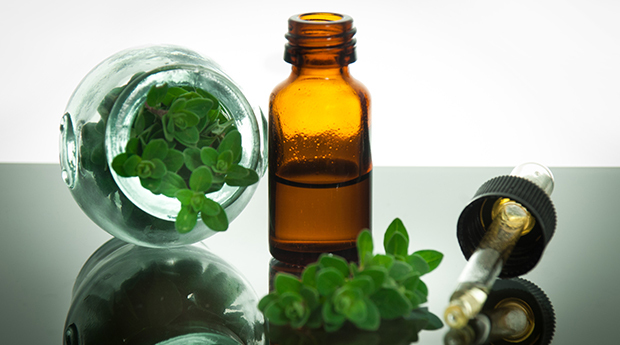 Always dilute oregano with an organic carrier oil prior to use as it could irritate the skin or nasal membranes. Never apply essential oils inside ears (externally is okay), anywhere near the eyes, or other sensitive parts of the body. It’s best not to use oregano oil with infants and children under age 5. Nursing and pregnant woman should also avoid oregano because it can possibly increase uterine circulation leading to a miscarriage. People who are allergic to plants such as mint, sage, and lavender may have a reaction to oregano oil. If you intend to use oregano essential oil for medicinal purposes, please know that essential oil quality matters. Find out whether the supplier of the essential oil you wish to use employs organic growing methods, and knows how to properly distill oils. Buy your oils from a trusted source because if they are improperly grown or distilled, they can have toxic chemical residues which could be harmful. Inside a bottle of oregano essential oil are powerful plant-based chemicals that can help you fight a virus, kill fungi and bacteria, chase off parasites, boost your immune system, counter the effects of aging, and so much more. 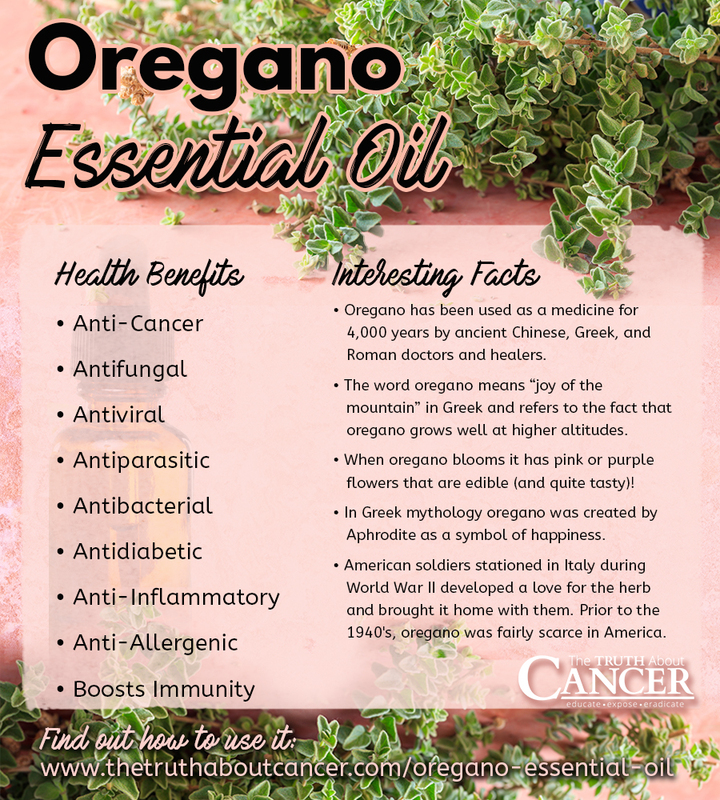 There has been extensive research into the positive health benefits of oregano essential oil, including its anti-cancer potential. It’s also been studied for its antifungal, antiviral, antiparasitic, antibacterial, antidiabetic, anti-inflammatory, antiallergenic, and immune boosting abilities. Oregano is a HOT oil and requires caution when using. Always dilute oregano with an organic carrier oil prior to using as it could irritate the skin or nasal membranes. This is an interesting article. In the summer, I grow oregano in a pot for me to use in cooking, but I never bought the oregano oil. Does the oregano oil have to be from Young Living? Which stores in Ottawa, Canada can I get oregano oil? Tip: Oil of oregano works best when consumed in a 50-per-cent dilution as the oil is very potent and difficult to tolerate in its 100-per-cent pure form. Dropping the oil under the tongue creates the quickest means for it to enter into the blood stream and begin the virus-fighting journey throughout the body that it is so well known for. As far as purchasing this oil in the Ottawa area (my home town), I would ask a pharmacist where would be the safest place to buy it. This oil is potent and must come from a reliable manufacturer. Good Luck. I have read it & now using in many ways. 2-3 drops under the tongue at the start of feeling a cold coming has helped me for years. The ‘cold’ feeling goes away before I know it. My toncile become demigde by origano oil. I got white spots on the tonsil. It was difficult to get rid of streptococcus from my throat. Be careful with origano oil. Beautifu article! Thank you Marnie! Anyone knowe how long you should use it (for example if you want to do a parasite/fungi/etc clense… 2,3 drops before meals… one time a day? For how long? It is a natural antibiotic so it should be used with caution. Me and my son use it 5drops under tongue after meal since it may give you burning sensation and drink plenty of liquids with it for 2 weeks than take break for a week. Have been doing that for 4 years now. Hi there, im taking a strong , quality oregano oil. 1 drop in a glass of water is well strong enough. Im taking this to try and clear candida from my system. I also take good quality probiotics. Now id like to know if taking oregano oil kills the good probiotics has well has the bad? Also how long can you take the oil for? Should you come off it for a bit then resume? I’m sorry to hear about your diagnosis – I will be sure to say a prayer for you! Unfortunately, we are unable to give any kind of medical advice. But we do have this article that may be helpful to you. My dad, 90 years old, had radiation for Stage I Vocal Cord cancer 4 months ago. The radiation was to be 98% curable. Just yesterday they now found a small amount of more cancer in same area. Since he had the initial radiation he’s had a ton of mucous, spitting up every 20 minutes day and night. He’s miserable, hasn’t slept. My elderly mom is up all night with him. They’re both exhausted. I’m exhausted. Despite an entire range of antibiotics the MD/ENT prescribed, and taking him to a very qualified Naturopathic Doctor who gave him cough medicines and tinctures and the like, and i’ve elimininated all dairy products and sugar, he’s still coughs up tons of mucous – no change. He’s also on Warfarin (Coumadin) for a stroke 7 years ago, otherwise he takes no other meds. I been applying Frankincense and Myrrh oils with a carrier from DoTerra for the last 4 weeks, prior to this new diagnosis of found cancer. Today I started applying Oregano oil topically with Castor Oil, and gave him a couple of drops to drink. I’m switching to the Oregano Oil for the next week or so to see if this gives him any relief. Do you have any other suggestions on how to get rid of this mucous and last bit of cancer. He has a followup with a surgeon in a month – they want to start cutting his throat – and i’d like the cancer all gone before that appointment. Please advise. Thank you.